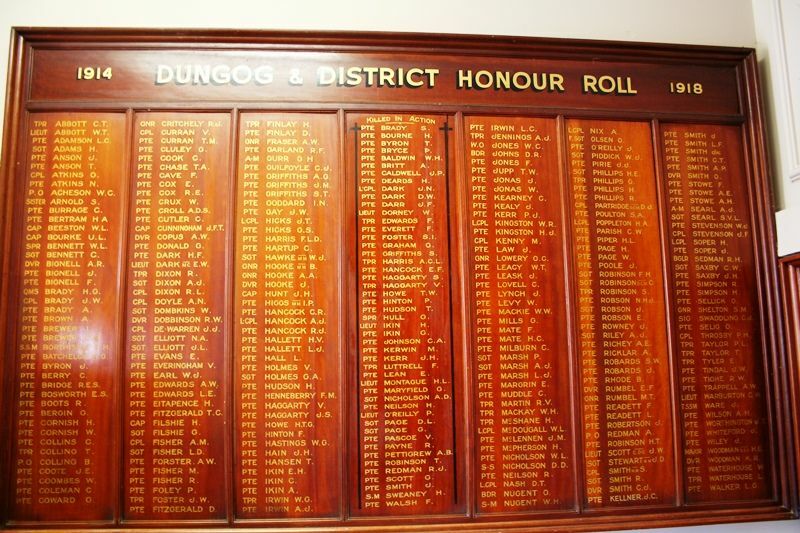 The residents of Dungog and district paid tribute to the local members of the A.I.F. in erecting to their memory, handsome tablets bearing their names. There were 303 soldiers thus honoured, of whom 46 paid the supreme sacrifice. The tablets were erected in the Memorial Town Hall, which building itself cost approximately £5000 furnished — another tribute to our soldiers. It can be safely said that this town and district is second to none in showing appreciation of the deeds of the soldiers and in commemorating them. The ceremony of unveiling the tablets was performed on Saturday last. The day was perfect and the attendance large. A procession of Scouts and Diggers marched up to the hall. A guard of honor formed before the tablets under command of Major Woodman, D.S.O. As many as possible crowded into the wide hall to witness the proceedings. His Worship the Mayor called upon Mr. T. Page and Major Woodman to carry out the unveiling. Mr. Page, who lost two sons at the war and whose wife died almost as a direct result of the shock, said that it was not with pleasure he performed the ceremony but with great sorrow in more ways than one. Major Woodman, who was the first soldier in the district to enlist, expressed the appreciation of soldiers of the district for the great honour afforded them both in the erection of the honor roll and also the memorial hall. It was a monument, as well, to the great work done by the people while the soldiers were away and it left the soldiers sadly in their debt. Major Woodman and Mr. Page then drew aside the flag covering the tablets. Mr. Watts sounded the "Last Post." All present joined in a hymn and many tears and sobs were in evidence. The tablets were well executed, the work being done by Mr. E. V. Woodman. They were French-polished to a beautiful surface, and the centre column black-bordered, signifying the list killed in action. Three columns lay on each side of this column. Mr. A. P. Coutts executed the printing of the names in gold in a manner that was a credit to him. The Maitland Weekly Mercury (NSW), 18 June 1921.